The war between 300 Sparta and the Kraken has been running out of control. The attacks constant, the bloodshed massive. With no end in sight and no clear victor, the leadership of both sides discuss peace. The war between 300 Sparta and The Kraken (along with their allies, the United Nations) was escalating out of control. Both sides were engaged in a campaign of fear, destruction and utter madness, with no clear victor in sight. The attacks on 300 Sparta's Pantheon and sole seat of power were numerous and seemingly never-ending, yet the stout defenders bravely weathered the constant storm, coming out on the other side weary, battered and bruised, but unbroken. The determination of these fighters impressed the highly experienced and well-ranked Kraken Coalition, prompting them to set aside their swords momentarily and agree to meet the leadership of 300 Sparta to discuss how things would proceed into the future. Lady Trish, the leader of the Kraken and Lady Val, the leader of 300 Sparta met in an undisclosed location. Unarmed and coming in with an open mind they set aside their differences and began to discuss how the recent wrongs committed by each side could be rectified to the satisfaction of their members. Upon the ending of the meeting, it was decided that a ceasefire was in order. Lady Val returned to her lands and immediately asked her member base to vote on whether a ceasefire was in order, or if the war would go on. 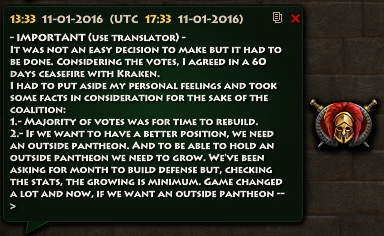 The attacks on both sides’ Pantheons were ordered to stop immediately, while the vote was decided. This break alone was much needed for the weary defenders guarding the Pantheons, finally gaining them a moment's break and rest after weeks of fighting for their survival. After a number of days and after much discussion amongst the leadership of 300 Sparta, it was decided that a ceasefire would be the best course of action, even though the results of the vote were clearly not unanimous. With this decision, we close another chapter in Sparta's history; another war has been put aside, but for how long? The thirst for battle is never-ending, and even now rumors stir of other wars, between other Coalitions that threaten to shatter the tenuous peace that rests over our lands. Play Sparta: War of Empires Now!